Newly appointed president Marysz Rames, Barb and Jim Kanter, and former president Curt Frye present the new sign for the C. James & Barbara K. Kanter Student Center. The Wayne State Foundation honored Jim and Barb Kanter of Minneapolis, Minn., on June 26 with a dinner and program to celebrate the newly named C. James and Barbara K. Kanter Student Center. 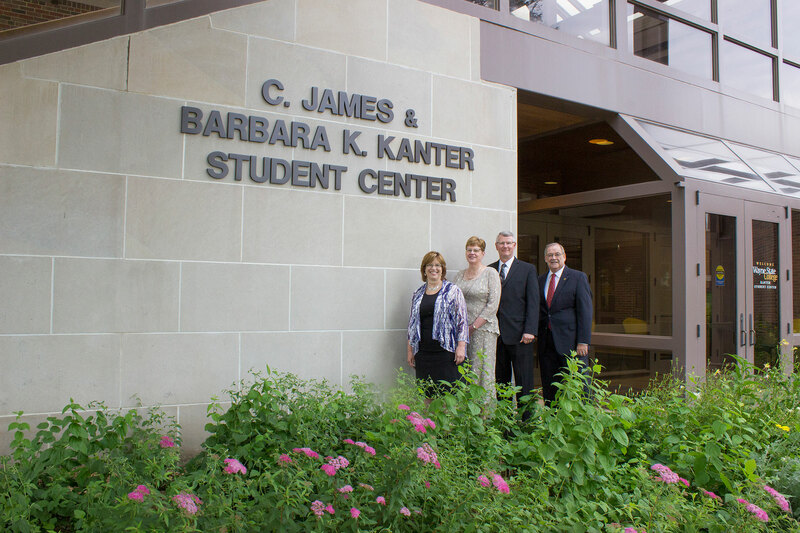 The Wayne State Foundation honored Jim and Barb Kanter of Minneapolis, Minn., on June 26 with a dinner and program to celebrate the newly named C. James and Barbara K. Kanter Student Center, which was dedicated in May. The Nebraska State College System Board of Trustees chose to name the center after the Kanters to recognize their major financial support and because they are individuals who bring honor to the college system by their values and work ethic. Phyllis Conner, vice president of development and executive director of the Wayne State Foundation, introduced and publicly thanked the Kanters at the dinner. The Kanters have financially supported many projects at WSC, including the Willow Bowl restoration, the US Conn Library renovation, the Alumni House renovation, the Barbara K. Kanter Endowed Scholarship, the Service-learning program and the general fund. Barb Kanter grew up in Wisner and graduated from WSC in 1976 with a bachelor’s degree in business administration. She serves as the secretary/treasurer of the Wayne State Foundation and was the recipient of the Wayne State Alumni Service Award in 2010. Jim grew up in Battle Creek and is a graduate of Kearney State College. They are both trustees of the Wayne State Foundation. Jim and Barb each expressed their gratitude and privilege to be a part of Wayne State College. She also credited Wayne State for her education and career success. Jim stressed that even though they started out with nothing, they truly cared about making a difference in the world together. “A long time ago, Barb and I were two farm kids trying to find our place in the world. We did not know each other, but we shared one common goal – to gain an education and give ourselves the opportunity to make a difference in the world,” he said.